The northern jaguar travels from a breeding population in Sonora to re-establish territory in the American Southwest. The journey, however, is an imperiled one. The jaguar’s historic travel corridor is fragmented by human activity, border wall expansion, and anti-predator policies. 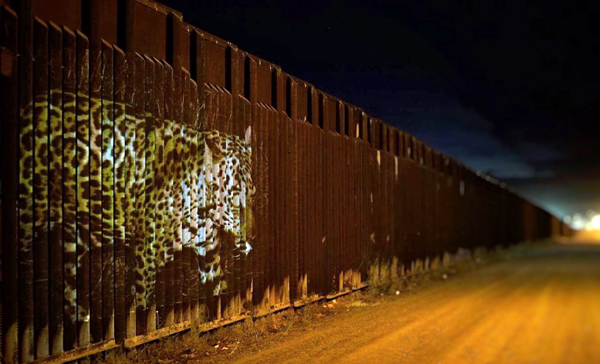 Un-Fragmenting / Des-Fragmentando: reuniting culture and ecology in the borderlands transforms the U.S.-Mexico border wall from barrier to backdrop, projecting jaguar and other wildlife images from the Northern Jaguar Reserve and neighboring Viviendo con Felinos ranches directly onto the rusted iron construct. Through binational cultural engagement, community education, and digital projection, ecological artist Lauren Strohacker and collaborators envision removing barriers to ensure the survival of a wide diversity of species, including the iconic jaguar. 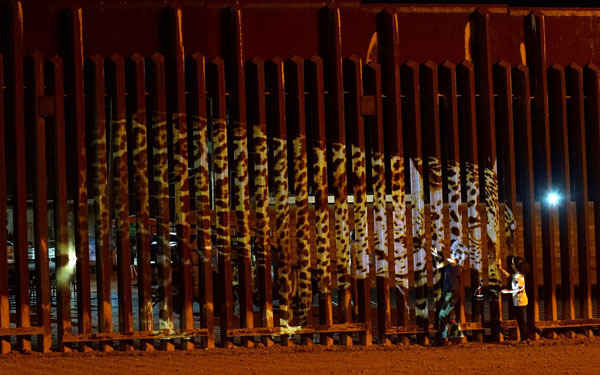 On May 12, residents of Douglas, Arizona, and Agua Prieta, Sonora, gathered while larger-than-life images of native wildlife, including male and female jaguars, appeared on both sides of the U.S.-Mexico border wall. The projections showed how animals in this region are negatively impacted by the current border wall and proposed expansions. The wall interrupts a crucial migration corridor and destroys habitat with a physical barrier, roads, and high-powered lighting, endangering these species and their fragile ecosystem. The mayors of Douglas and Agua Prieta shook hands through the border wall before they spoke. Each expressed a passionate and collaborative vision for the future where borders are not physical barriers but celebrated spaces that protect humans, wildlife, and their shared environment. Lauren Strohacker delivered the final speech of the evening, explaining her inspiration and vision for Un-Fragmenting / Des-Fragmentando to broaden the conversation about the border wall and connect culture and ecology through creative, community-based projects. During Un-Fragmenting / Des-Fragmentando, we saw many reasons to hope that the future is one of cultural and ecological awareness, appreciation, and protection. These projections will be shown in communities along the length of the border in an ongoing effort to raise awareness and inspire action in the borderlands and beyond. Un-Fragmenting / Des-Fragmentando is in collaboration with the Northern Jaguar Project, Border Arts Corridor, Casa de la Cultura, Conciencia y Educación Ambiental, and with support of the U.S. Border Patrol, city of Douglas, Arizona, and city of Agua Prieta, Sonora.